(only a few, and only post war, incl. pictures). Abbreviations: gt=gross tons, dwt=deadweight tons, and dimensions are overall length, breadth and draught unless noted otherwise. 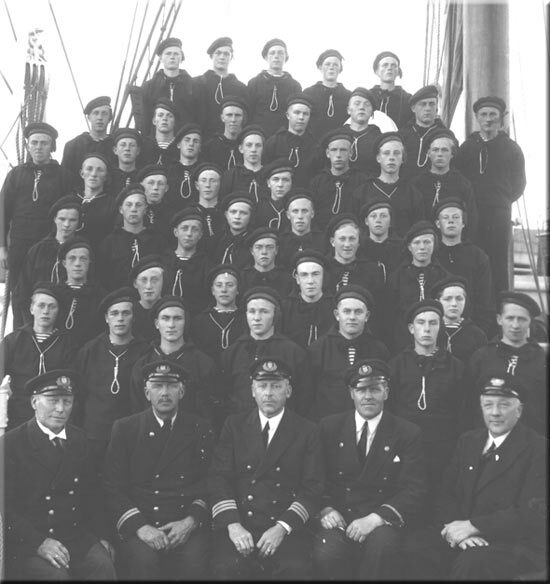 Skoleskipet Tordenskjold - On board in 1937. Training Ship. Recognize anybody? If so, please contact me. My father is on the far rigth in the 2nd row, behind the officer. My Norwegian Guestbook has a message from someone who thinks his grandfather, Rolf Ludvig Larsen is on this picture, but according to this message, which also names several others, he is not present. No. 2 in the first row has been identified as Yngvar Vold (see this message). See also this message re. Leif Gilde. Trondheims Skoleskibsdirektion. Built in 1905, 254 gt. D/S Gudrid - On board ca. 1938 - 1939? A/S Herdis (manager Bachke & Co, Trondheim). Built 1922 by Stavanger Støberi & Dok, Stavanger. 1305 gross tons, 728 net tons, 2200 deadweight tons, length 242 ft 11 in, breadth 37 ft 4 in, depth 16 ft 2 in, draught (draft) 16 ft 1 in. Triple expansion steam engine, 144 nominal horsepower. Signal letters LDZQ. 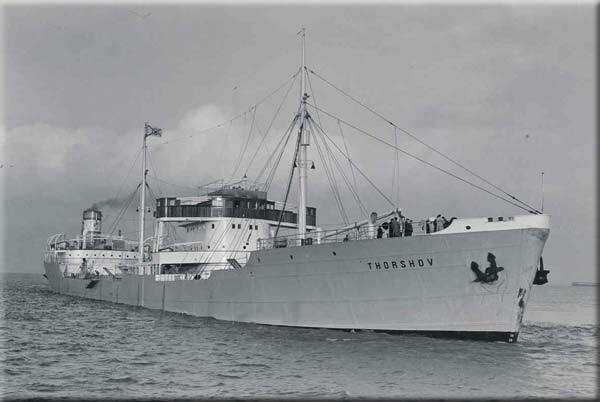 Sailed Trondheim March 20-1938 (this may have been the date he joined her) and arrived Manchester April 2, probably at Preston, which was one of the regular ports of call before Manchester. Sailed Liverpool June 18-1939 for Trondheim (he may have paid off at this time). Was in Norwegian waters at the time of the invasion and came under German control. At Oslo on Sept. 21-1943, Aug. 8-1944 in Norwegian coastal trade. Lost at Porsgrund March 30-1945. Raised at the end of 1945 and towed to Nylands mek. Verksted for extensive repairs. Back in service in 1948. Sold in 1960 to Bulet-State Economic Enterprice, Sofia, registered in Varna, Bulgaria under the name Breza. Sold in 1964 to Red Sea Development Corp, Massawa, Ethiopia, renamed Harar. 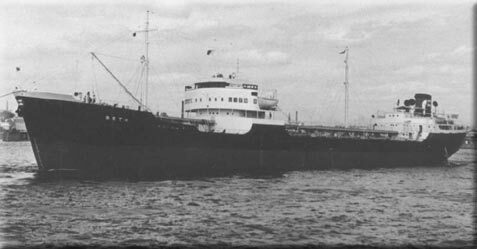 Sold in 1964 to Navigation Maritime Bulgare, Varna, Bulgaria, renamed Algeneb (Algenib?) Sold to Italian breakers in 1965, probably Ardem, and arrived Vado on Oct. 5-1965 to be broken up. Listed in the Homefleet section. S/S Nidarland - On board 1939 Ex Wisconsin, Ex Wawalona. A/S Nidaros, Karl Krogstad. Built 1919. 6076 gt. Torpedoed and sunk Nov. 9-1942 by U67, 11 41N 60 42W (the day after the allied invasion of North Africa), one died, 34 survived. My father was in a prison camp in Africa at the time, but soon to be freed. In his letter No. 4 he says: "On the night leading up to the 8th of May, 1945 we were on our way to America after having unloaded petrol in Liverpool. We were in about the same position as the passenger ship Athenia (external link) had been when she was sunk by a German U-boat on the 3rd of September, 1939. At that time I was on board the S/S Nidarland, and we went to assist her. Anyway, 6 years later I happened to be in just about the same location, and in the course of those 6 years I had taken note of a few disturbances..."
More details on this ship is available on this page. S/S Ringulv - On board ca. 1940-'41. Ex Norskehavet, Sigrun, Lyngenfjord and Keramiai. Sigrun - Source: Leif. M. Bjørkelund's collection, w/permission. More pictures are available on my page about Ringulv, link below. A/S Ringulv - Olav Ringdal, Oslo, Built in Glasgow in 1903. Captain Thorvald Messel. 5153 gt. 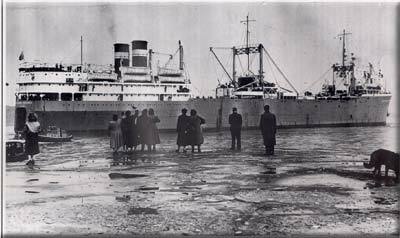 Renamed Ste Marguerite (some sources say Ste Marthe) after she was requisitioned in Safi, Morocco, in the summer of 1941. The crew, including my father was sent to various labor camps in Morocco and Algeria (link at the bottom of this page). She sailed under the French flag until the end of November 1942, at which time she was put into German service under her previous name Ringulv. Torpedoed by the British submarine HMS United on June 14-1943, sunk 37 54N 15 42E. 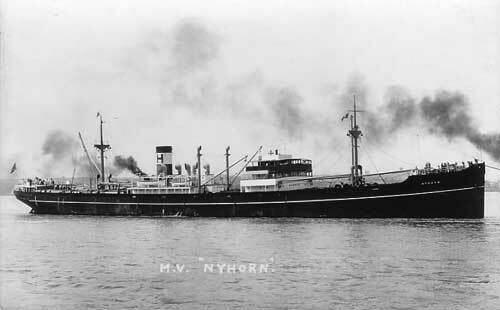 My father was on board the M/S Nyhorn at that time. (There's much more information on this ship under D/S Ringulv). 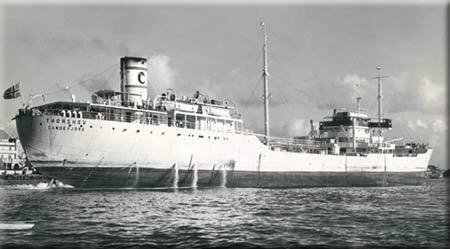 M/S Nyhorn - On board in 1943. A/S Atlas, Christian Haaland, Haugesund, built in Copenhagen in 1929. Captain Frants Askeland. 4494 gt. Early in 1943 this ship, which had been sunk in the Lyautey river during the allied invasion of Morocco (Operation Torch - see The Invasion of North Africa under Links related to my father's story) was raised and repaired by a chosen crew, and put into allied service again. My father stayed on board for about a year before paying off in London to attend the Norwegian Radio Officers' School there (see Odd's Letters - Letter No. 4). 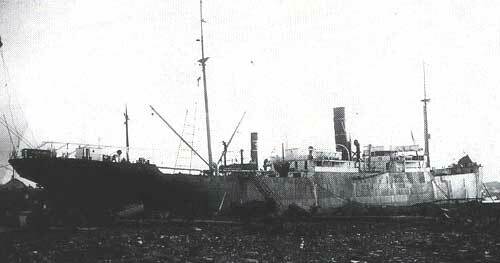 M/S Nyhorn continued with the convoy crossings and made it safely through the rest of the war. Sold in 1962 and renamed Maritsa, later under Panama-flag from '65 under the name Mastrostamatis, then renamed "Sandimitrios" in 1966. See my page M/S Nyhorn for a lot more details. 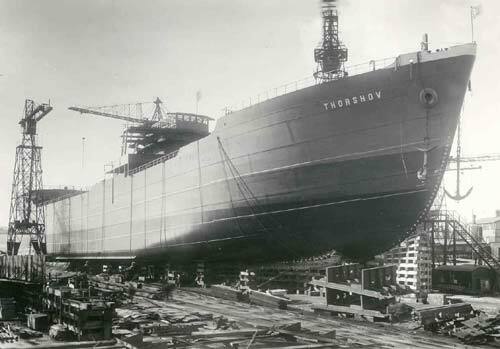 M/T Thorshov - On board Oct. 1944-May 1946. Scrapped in 1959. A/S Thor Dahl, Sandefjord. Built 1935. Captain D.E. Andersen, Chief Mate Torleif Fidje. 9955 gt. My father's first job as a Radio Officer. 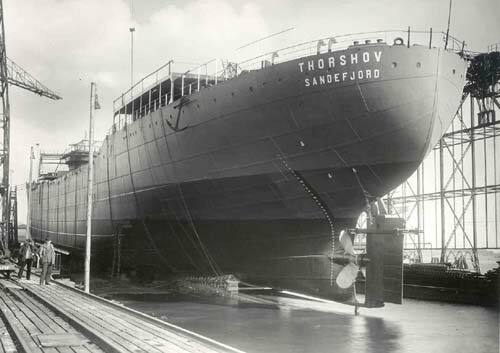 The Thorshov crossed the Atlantic 50 times in the course of the war. The captain's name during the war years was Bjarne Svenningsen. Pic 1 | Pic 2 | Pic 3 | Pic 4 | Pic 5 | Pic 6 | Pic 7 | Pic 8 (the latter 2 appear to have been taken while she was buing built). And here is a picture of a painting, painted by Jan Goedhart, Holland. Sold on Apr. 29-1954 to International Mercantile Navigation Co SA, Panama, and renamed Montemar. Sold to Brodospas, for scrap, and arrived Split on Dec. 31-1959 to be broken up. Here's my page about Thorshov. M/S Titanian - On board Sept. 1946-April 1947. Ex Iossifuglu. A/S Rederiet Titanian, Hilmar Reksten, Bergen. Built in 1924. 4880 gt. Captain Bernt Breivik. This could be the same Bernt Breivik who took part in the escape from Dakar to Freetown on board the M/S Lidvard in July of 1941, (details under "Interned Ships", link below). At that time he was the captain on board S/S Hadrian. A book was written and a movie made about this incredible escape. M/S Titanian struck a mine in 1947 while my father was on board - see Letter No. 4, fourth paragraph from the end of the letter. (There's more on this incident on my page about M/S Titanian). Picture source: Roger W. Jordan collection. 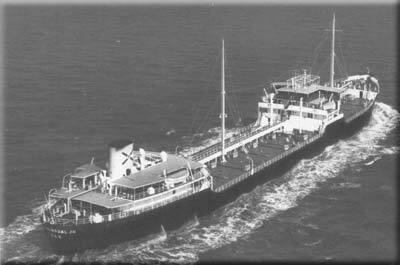 M/S Tai-Shan - On board Aug. 1948-Febr. 1949. Wilh. Wilhelmsen, Tønsberg. Built in Malmö 1929. 6962 gt. Also, see my page about Tai Shan. Sold on March 17-1960 to Nichimen Co., Osaka, Japan for scrapping. Arrived at Mihara on July 23-1960 and demolition commenced on the 25th at Kihara, Mihara-shi. (Tai Shan is one of the five sacred mountains of China). Here's a Guestbook message from the son of Odd S. Nilsen, who also served on Tai Shan. M/S Toronto - On board Oct. 1951-Dec. 1951. Wilhelm Wilhelmsen. Completed in 1928. 5018 gt. Was sold to A/S D/S Fjeld, Anton Meidell, Bergen in October 1951, and renamed Hordnes in 1952. 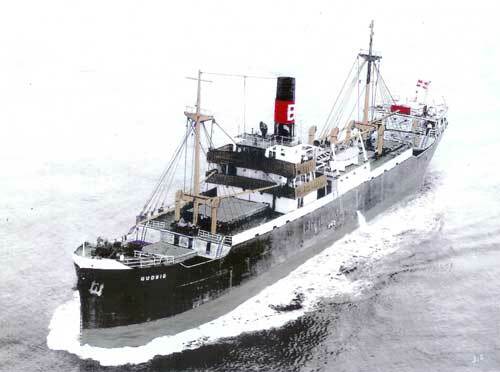 Sank off Swinoujscie after striking the wreck of S/S Orion while on a voyage from Murmansk to Stettin in the spring of 1956, but was refloated later that year and towed to Kiel - condemned in March of 1957 and sold to Eckhardt & Co. for scrapping. Here's more info on Toronto. M/T Olav Ringdal Jr. - On board Febr. 1952-March 1954. Olav Ringdal's Tankrederi AS (manager Olav Ringdal, Oslo). Built in 1948 by Eriksbergs mek. Verkstads A/B, Gothenburg. Captain Arne Bjørnstad. 9815 gt, 15 700 dwt, dimensions 518 ft 4 in, 65 ft 4 in, 28 ft 8 in, 7-cylinder diesel engine, B&W type made by Eriksbergs. Exploded in Queens Dock, Swansea on Nov. 27-1954 and broke in two, 3 men died. 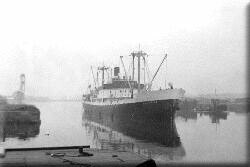 Later towed to Liverpool for repairs at Harland and Wulff, re-entering service in July-1955. Sold in Jan.-1960 to Ångfartygs-AB Alfa (Lundqvist-Rederierna), Mariehamn and renamed Olav. Sold in Dec.-1968 to N. R. Bugges Skibs-A/S & A/S Hektor (N. R. Bugge), Tønsberg. Foreship removed at Framnæs mek. Verksted, Sandefjord and sold to Christiania Spigerverk for breaking up in Grimstad, while the after part was added to a section of the former Etnefjell, and the completed ship delivered in Apr.-1969 as bulk ship Besna, 11 502 gt. Sold in Oct.-1971 to Cassiopi Shipping Co. SA, Piræus, renamed Scaproad. 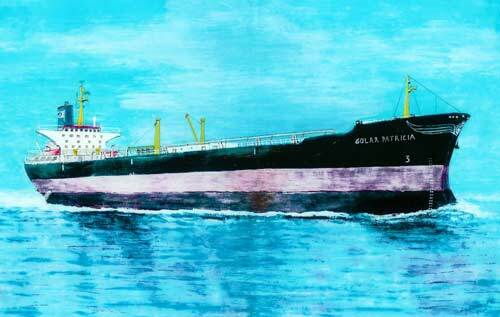 Sold in March-1974 to Ken Hieng Navigation (Panama) Corp. SA, Panama and renamed Ken Lung. Sprang a leak and sank on July 3-1977 off Adaman Islands, voyage Visakhapatnam-Japan. (I received this picture from someone who had a relative on board). Here's a Guestbook message from someone who was on board at the same time as my father. M/S Toledo - On board April 1954-June 1954. 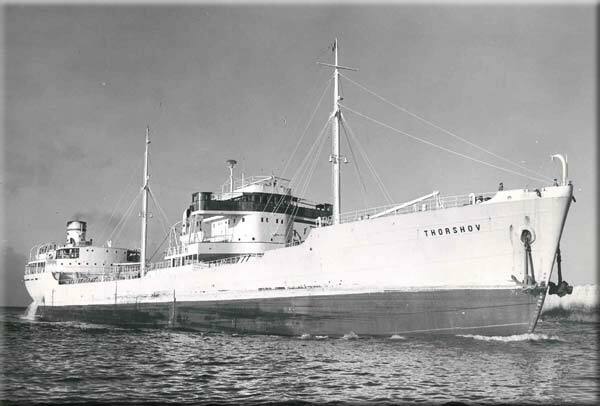 Sold in November of 1958 to Einar M. Gaard A/S, Sigurd Haavik A/S and Trygve Klovning, Haugesund and renamed Gardvik. Broken up in Hong Kong in 1964 (more details on my T-page). I also have a page about Toledo. M/T Polarbris? - On board June 1954-Oct. 1954. Built by Barclay Curle & Co., Glasgow in 1951 (Yard No. 721), 12 453 gt, 7222 net, 18 630 tdwt, 566' x 73' x 32'. Picture source: Painted by Jan Goedhart, Holland. 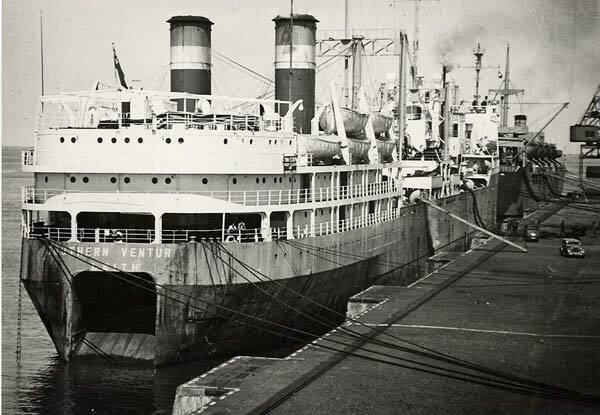 Southern Venturer - On board Oct. 1954-May 1955. Whale factory ship. Sevilla Whaling Co Ltd, (Chr. Salvesen & Co, Leith, managers). 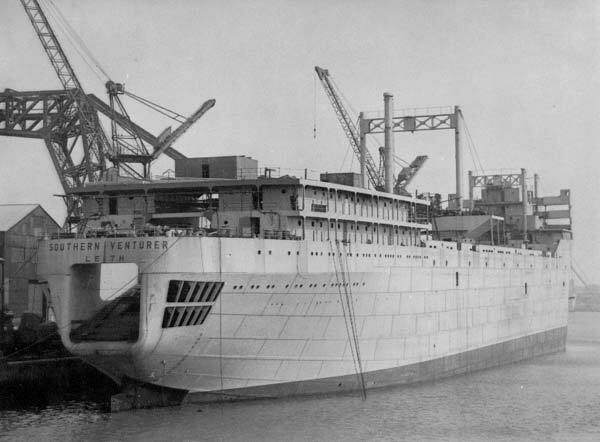 Completed at Furness Shipbuilding Co Ltd, Haverton Hill, in October 1945 for The South Georgia Co Ltd.
14,493 gt, dimensions 556 ft, 74 ft 5 in, 34 ft 6 in, 2 screws, 2 triple-expansion engines. 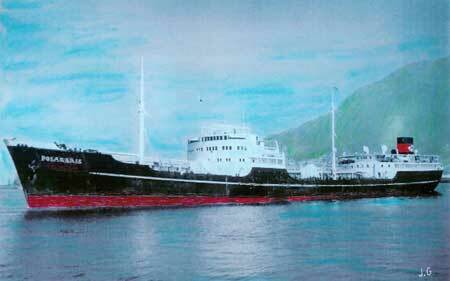 In June 1962 she was sold to the Japanese fisheries company Nippon Suisan KK, of Tokyo, and renamed Southern Venturer Maru. 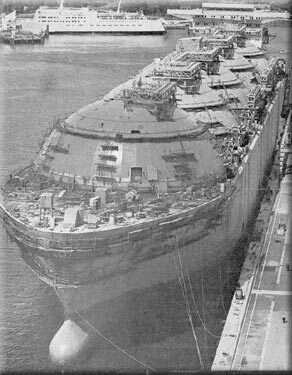 In March 1963 she was laid up at Innoshima and did not re-enter service. In December 1964 she was sold to be broken up in Japan. And another (gorgeous picture - from a visitor to my site). And another - This was sent to me by a visitor to my site named Rod, whose father in law worked for a local newspaper in Middlesbrough during WWII and took this picture while she was under construction. For info, my Find Old Shipmates Forum has several messages from people who served on this ship (use the "search" feature to find them). The picture was sent to me by RW Jordan, added here with permission. Mr. Jordan has also provided me with the facts on this and many of the other ships on this page. J. K. Hansen - On board Sept. 1955-April 1956. Whaler. Union Whaling Co Ltd, Durban, South Africa, under British flag. Built 1951 by A & J Inglis Ltd, Glasgow. 742 gt, 184 ft 3 in, 32 ft 3 in, 16 ft 10 in. 4-cylinder triple expansion engine, 486 nominal horsepower. M/S Ragnvald Jarl - On board July 1956-April 1957. Det Nordenfjeldske Dampskipsselskap, Trondheim. Captain Paul J. Holm. Coastal cargo and passenger vessel. Built 1956 by Blohm & Voss, Hamburg, delivered on July 24. 2196 gt, 266 ft 7 in, 41 ft 6 in, 14 ft 9 in, 10-cylinder MAN diesel. Certified for 450 passengers in coastal traffic, 285 beds. Entered the Express Service (Hurtigruten) from Bergen on July 28-1956. Had a small fire on board on Sept 12-1957. In Nov.-1967 she was at Blohm & Voss for engine overhaul and ugrading of the interior. Collided on Oct. 27-1972 with M/S Yløytind underneath the Tromsø bridge. Damaged again in Oct.-1975 at the Tromsø bridge. Ran aground on Febr. 20-1978 at "Risøyrenna" near Andøy, resulting in a small propeller damage. Extensive upgrade completed in Nov.-1983 at Mjellem & Karlsen, Bergen, including the addition of 12 new cabins, new reception area, cafeteria rebuilt. When the company was purchased by Norcem in Oct.-1984, the shipping section became the company Nordenfjeldske Shipping A/S. The company was sold in Apr.-1985 to A/S Kosmos and organized as a "daughter company" of Bergenske Dampskibsselskab, Bergen, which in turn was sold on Jan. 1-1989 to RoNoTro A/S and Ragnvald Jarl sold/transferred to Troms Fylkes Dampskibsselskap that same year. In Sept-1995 she was taken out of Hurtigruten and sold to Rogaland Sjøguttskole, renamed Gann (external link) and used as a training ship, as well as in the tourist trade in the summer season (Stavanger-Nordkapp), and still used as such in 1999. Havtroll - On board June 1957-Aug. 1957. AS Havtor (manager Peter Meyer, Oslo). General cargo vessel. Built 1956 by Eriksbergs, Gothenburg. 5169 gt, 8200 dwt, 434 ft 10 in, 58 ft 1 in, 25 ft 11 in, 6-cylinder B&W type diesel engine. 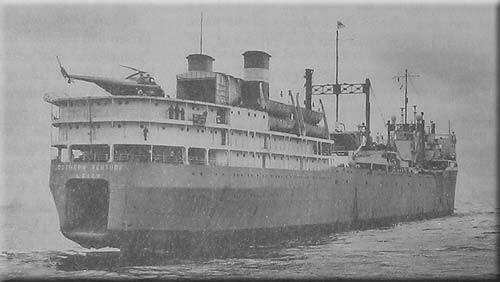 Southern Laurel - On board Oct. 1957-April 1958. M/T Aurelian - On board June 1958-Dec. 1959. A/R Titanian (manager Hilmar Reksten, Bergen). Built 1950 by Kockums MV AB, Malmö. Captain Harald Schmidt. 8687 gt. Registered length 476 ft 5 in, 62 ft 3 in, 34.8 ft depth, 7-cylinder diesel engine. M/T Beth - On board Jan. 1960-July 1960. AS Bill (manager L Gill-Johannessen, Oslo). Built 1949 by Kockums, Malmö. 8630 gt, 13,270 dwt, 496 ft 4 in, 62 ft 2 in, 27 ft 2 in, diesel engine. Source for picture: Karl H. Henriksen. This Norwegian Guestbook message is from another crew member at that time. Mosjøen - On board July 1960-June 1961. I/S Bulktrading (manager Torvald Klaveness, Oslo). General cargo/bulk carrier. Built 1958 by Travewerft GmbH, Lübeck. 2000 gt, 2872 dwt, 269 ft, 40 ft 10 in, 18 ft 11 in, Deutz diesel engine. Ulefoss - On board July 1961-Sept. 1961. 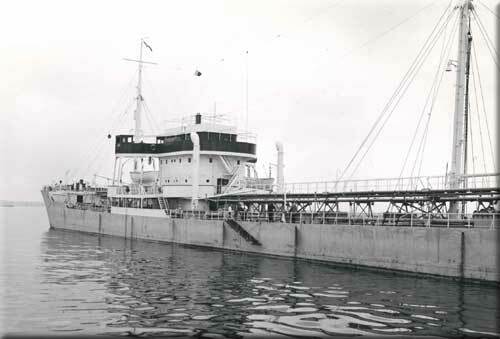 Ex Ulefoss (till 1947), Ulv Jarl (till 1949). Skibs AS Thor Thoresens Linje (manager Thor Thoresen & Co, Oslo). General cargo vessel. Built 1947 Nylands Verksted, Oslo. 1401 gt, 2570 dwt, 272 ft 10 in, 41 ft 2 in, 17 ft 7 in, compound 2-cylinder steam engine with low pressure turbine. The pictures was taken in the early 60's (near Manchester) and sent to me by a visitor to my website. Bomi Hills - On board Dec. 1961-Febr. 1963. Skibs-AS Orenor (manager Torvald Klaveness, Oslo). Ore and oil carrier. Built 1952 by Fairfield Shipbuilding & Engineering Co Ltd, Linthouse, Glasgow. 17,853 gt, 23,870 dwt, 638 ft, 80 ft 5 in, 30 ft 7 in, 6-cylinder Fairfield/Doxford diesel engine. Baleares - On board June 1963-Aug. 1963. I/S Freezer (manager Torvald Klaveness, Oslo). Refrigerated cargo carrier. Built 1959 by Verschure & Co Scheepswerft, Amsterdam (377). 2825 gt, 2953 dwt, 377 ft 2 in, 53 ft 4 in, 20 ft 1 in, MAN diesel engine. Sold to Germany in 1966 and renamed Brunstal. Sold to Norway and managed by A/S J. Ludwig Mowinckels Rederi, Bergen from 1970, renamed Salta. Sold again in June-1977 and renamed Gema, Panamanian flag, owners in Buenos Aires. Renamed Salta again in 1985 (Panamanian flag). Broken up in 1986. Prospector - On board 1967. Lib-Ore Steamship Co Ltd, Monrovia, Liberia (manager Aluminum Company of America Inc, Pittsburgh and New Orleans). Ore carrier. Completed June 1950 by Hawthorn, Leslie & Co Ltd, Hebburn, River Tyne. 7484 gt, 12,417 dwt, 508 ft 8 in, 64 ft 3 in, 24 ft 1 in. Doxford type diesel engine. Ocean Oil Ventures Inc, managed by Gotaas-Larsen. Liberian flag, steam turbine tanker. Built by Kawasaki Heavy Industries Ltd, Sakaide, Japan, in 1969. 98,894 gt, 216,326 dwt, length 1072 ft 11 in, breadth 158 ft 4 in. 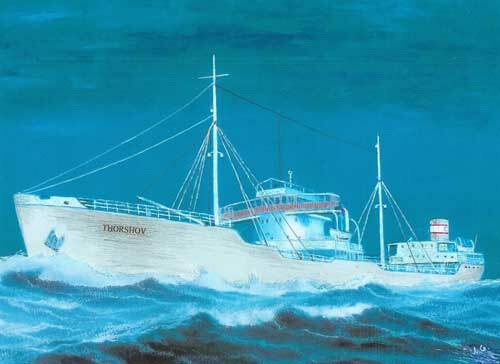 Here's a picture of a lovely painting of this ship - received from and painted by Jan Goedhart, Holland. 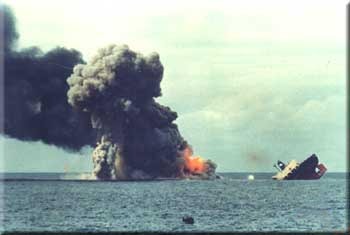 While on a ballast voyage from Coryton, River Thames (where my husband and I went to visit my father on board), to Bahrain, Golar Patricia broke in two and sank after three massive explosions and fire on board, about 130 miles from the Canary Islands in lat 30 36N long 14 25W, on 5 November 1973. One of the 43 persons on board died. The remaining 42, including Captain Harald Stormo, two female passengers and a 1 year old child, were picked up by the Spanish passenger vessel Cabo San Vicente and taken to Tenerife. The master later stated that the first explosion occurred in an empty tank while it was being cleaned. In terms of deadweight tonnage, Golar Patricia, which had a hull and machinery insured value of $24 million, became the largest vessel ever to become a total loss. Over two years later she was superseded by the 227,556 ton Berge Istra. Picture 1: M/T Golar Patricia has broken in two and is about to sink. Picture 2: The crew of Golar Patricia in the lifeboat. 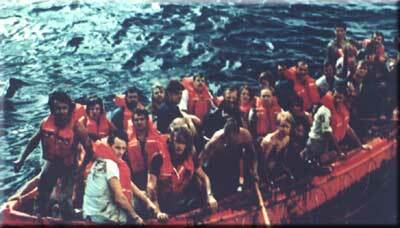 My father is in the middle of the boat, behind the young man with no shirt on (who, by the way, has left a message in my Norwegian Guestbook - his name is Henning Larsen. I've also received a message from Egil Nylén, who was also on board at the time. He had his 15 month old daughter and pregnant wife with him. Another message in my Guestbook is from the son of a crew member, who also served on Golar Freeze below, and here's a more recent message from the son of another seaman who was on board Golar Patricia. See also this Guestbook message. My father was interviewed by several newspapers after he had returned to Norway, so if anyone had a relative on board and needs more details, I'd be glad to supply them. It's hard to even begin to imagine what my father must have gone through when the explosion occurred; he must have thought he was back on the 1940's Atlantic again with its torpedoes and mines! The nightmares of those days haunted him for the rest of his life. See also this external link. M/T Golar Martita - On board ? Gotaas-Larsen. Built by Kawasaki Heavy Industries Ltd, Sakaide, Japan in 1958. (Info in the next 2 paragraphs was received from Arve Wiborg - his source: "The Golar Chronicle"). Crude oil carrier, 25 342 grt, 42 270 tdw, 216.4 x 28.3 m (length and beam), 2 x Kawasaki steam turbine machinery, geared to single shaft, 16 500 SHP, 17 knots. 1958 (July): Delivered by Kawasaki Dockyard Co. Ltd, Kobe, Japan to Ocean Ore Carriers Inc, Monrovia, Liberia (Gotaas-Larsen Inc, NY/Oslo). Scrapped August 1975 after machinery breakdown. Sold Kaohsiung,Taiwan for breaking. Three sister vessels were ordered: S/T Siri (named after Irgens Larsen's eldest 12 years daughter Siri), S/T Jeanne Marie and S/T Martita (later Golar Martita). Sea trials June 1958. She was named after Mrs. Martita Gundersen, married to the vessel’s part-owner. Others have told me: Sold and renamed Marianne Conway in 1975. Broken up at Kaohsiung in August 1975. Here's a Guestbook message from the daughter of someone who sailed on this ship (Knut Jørgensen). She's interested in getting in touch with others. My father continued to sail until he was well over 60 years old, and on this ship he served as 2nd mate after having attended school in Stavanger in 1976/'77 to get his Mate's Certificate. This was mainly to be near his first grandchild, my son Konrad Mitchell, who was named after him (born just before Christmas in 1975, 4 days after my father's birthday). I'm not sure how long he was on board this ship, but by Dec. '77 he was at home again, having paid off in Japan. 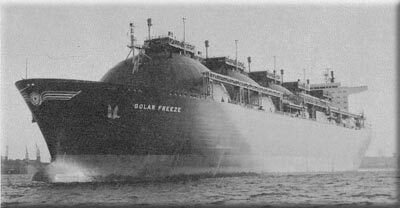 According to a posting on my Ship Forum Golar Freeze was built by Howaldtswerke D W at Kiel in 1977 for Golar Gas Operations Inc. She is a LNG Carrier (=Liquefied Natural Gas) of 85,158 grt., registered in Liberia. She was still sailing under the original name and owner in 2000. The pictures of Golar Freeze posted on this page were sent to me by Roger W. Jordan. Here's another picture he sent me. Egil Nylén (from Golar Patricia) has told me about the last 4 ships on this list, but I'm unsure of the sequence. It looks like this was the only ship my father served on in the capacity of mate, then later went back to his old profession. My Guestbook has a message from someone who served on this ship in 1977. M/T Golar Kanto - On board ? Probably as radio operator again. According to an old letter I have he was still at home in May-1978, but another letter is dated Durban June 26-1978, at which time he's on a ship which he joined in the U.S.? He says they will leave Durban for Bombay on June 28, then on to Karachi. (I mention this in case these details will enable someone to help me determine the sequence of these ships). Gotaas-Larsen. Built by Kawasaki Heavy Industries Ltd, Sakaide, Japan in 1972. Sold in 1988 sold to Brookstream Sg. Inc., renamed Axon. Arrived Chittagong for breaking up July 1992. In my English guestbook there's a message from the captain, Steingrim Melbø. I believe this must have been his last ship. "We have been informed that Mr.Holm passed away on 9th October (date is incorrect) age 74. He sailed with the Company from 1973 to 1981, most of time as Radio Officer. In 1976/77 he took a year off to secure a Mates qualification after which he returned to service and completed one contract as 2nd Officer on "Golar Freeze". He was, however not a youngster at that time and it was probably a bit late for him to switch careers. He therefore returned to the Spark´s job for a few more contracts until he quit sailing altogether. He was an old trooper in many respects having sailed during the war years and, as if that was not enough, he was onboard the "Golar Patricia", the VLCC that exploded and sank off the Canary Islands on November 5th, 1973. As far as we know he was no worse off from that frightening experience. We have heard very little from him over the years, but from time to time Capt. Melbø, with whom he retained close contact, told us that he was doing well in retirement. We pay tribute to his memory". His shipmate from Golar Patricia has also told me that Gotaas Larsen no longer exists. 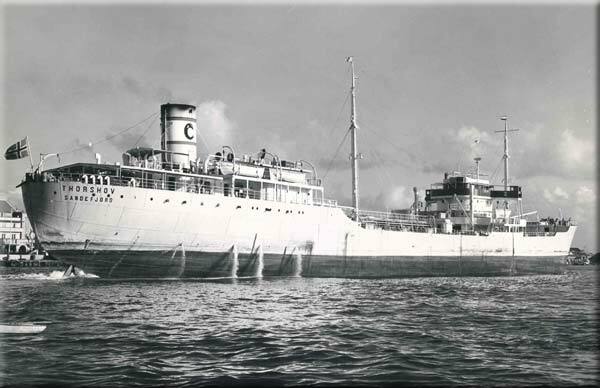 The company was purchased by Barcley Brothers in London, later by a Singapore based company, which subsequently sold most of the fleet to John Fredriksen. See also Picture Index for links to pictures of my father and various documents from the war years, or go directly to Odd's Album.